As Everything Dinosaur team members prepare to write about the formal scientific description of a new species of oviraptorid from the Late Cretaceous of southern Mongolia, we have been brushing up on our knowledge of the Oviraptorosauria clade. The Oviraptorosauria is a very diverse clade of Theropods. The Oviraptorosauria clade is an atypical branch of the maniraptoran Theropods. They are characterised by short, deep skulls, jaws which lack teeth (edentulous in derived, advanced members of the clade), short, stunted tails and tail bones with lots of air sacs within them (pneumatised proximal caudal vertebrae). The first of these dinosaurs were formally named and described in the 1920’s (Oviraptor and Chirostenotes), over the last three decades, numerous new members of this clade have been identified, mostly from Upper Cretaceous strata. The oviraptorosaurs are likely to have originated in Asia. The earliest fossil record of these dinosaurs is reported from the Lower Cretaceous Yixian Formation of China. It is likely that these dinosaurs were feathered and most of them were relatively small and light-weight. However, there were exceptions to this rule, such as the huge Gigantoraptor (Gigantoraptor erlianensis), that stood nearly as tall as a giraffe. 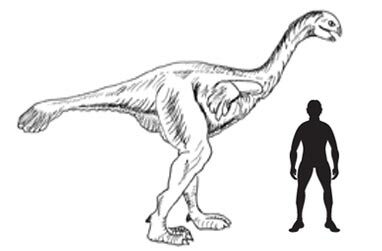 Gigantoraptor was named and described in 2007: New Giant Chinese Dinosaur Described. The largest feathered animal known to science. The Avimimidae – which for the moment contains a single genus (Avimimus), with two species from the Nemegt Formation of Mongolia, although the provenance of the first fossils associated with this genus is not clear. The Caenagnathidae – which are known from North America and Asia with numerous genera including the giant Gigantoraptor erlianensis. The Oviraptoridae – which are only known from Asia, although there are more genera recognised than within the more geographically widespread caenagnathids. Of these three dinosaur families, it can be argued that the Oviraptoridae are the best understood. Many genera are known from nearly complete fossil skeletons, whilst in the case of most caenagnathids, these dinosaurs are mostly known from highly fragmentary and far from complete material. We look forward to publishing an article in the very near future describing a new member of the Oviraptoridae from the famous Upper Cretaceous deposits of the Nemegt Formation of Mongolia. Our article has been published, say hello to a new Asian, Late Cretaceous oviraptorid – Gobiraptor minutus.